U2 have cancelled their Saturaday (September 16) show in St. Louis after racial violence erupted over the acquittal of a white officer who killed an unarmed black man. On Friday night, 32 protesters were arrested and ten police officers were treated for injuries including two who were hospitalized after being hit with bricks. We have been informed by the St. Louis Police Department that they are not in a position to provide the standard protection for our audience as would be expected for an event of this size. We have also been informed that local crowd security personnel would not be at full capacity. In light of this information, we cannot in good conscience risk our fans' safety by proceeding with tonight's concert. As much as we regret having to cancel, we feel it is the only acceptable course of action in the current environment. 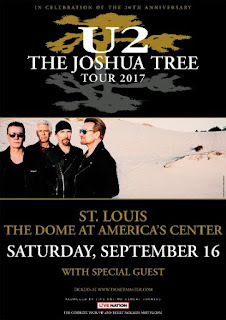 U2 are currently touring behind the deluxe edition of their album The Joshua Tree.